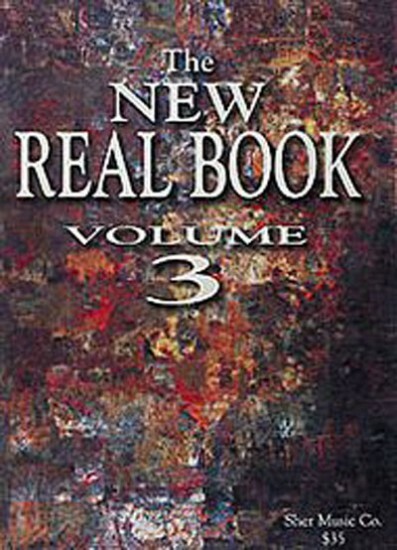 The New Real Book - Volume 3 (C Edition) by Various. For C instrument. The Most Useful New Real Book yet!. Jazz and Pop. Difficulty: easy-medium to medium. Fakebook (spiral bound). Melody, chord names, introductory text, black & white photos and lyrics (on some songs). 436 pages. Published by Sher Music Company. With melody, chord names, introductory text, black & white photos and lyrics (on some songs). Jazz and Pop. 9x12 inches. The Most Useful New Real Book yet! No duplication of tunes in Vol. 1 and 2. Same high quality! Part-Time Love, Bird Of Beauty, Creepin', That Girl, Too High, What's Going On?, I Heard It Through The Grapevine, How Sweet It Is, Knock On Wood, Hold On, I'm Coming, What's Love Got To Do With It, Respect, Dancing In The Street, Heat Wave, and many more! Chick Corea (Litha, Chick's Tune, etc. ), John Coltrane (Grand Central, etc. ), Bill Evans (Since We Met, Emily, etc. ), Miles Davis (So Near, So Far, etc. ), Yellowjackets (Freedomland, etc. ), Kenny Kirkland (Midnight Silence, etc. ), Maria Schneider (Gush, etc. ), Bob Berg (Promise, etc. ), Tom Harrell (Sail Away, etc. ), and Many more!! Gentle Rain, Caravan, You Must Believe In Spring, I Fall In Love Too Easily, I Hear A Rhapsody, If You Could See Me Now, Prelude To A Kiss, Invitation, In A Sentimental Mood, Just Friends, You Stepped Out Of A Dream, The Lamp Is Low, Moon And Sand, On Green Dolphin Street, The Second Time Around, Laura, This Is New, Stompin' At The Savoy, Sweet Lorraine, For All We Know, Spring Is Here, Star Eyes, Stars Fell On Alabama, That Old Feeling, You've Changed, and many more! !